NEW YORK, Feb. 8, 2019 /PRNewswire/ -- Leading global firm Concierge Auctions announced seven successful auctions at its annual January Sale in Arizona. The sale concluded January 31 — with over $43 million in total sales and an 87.5 percent sell through rate — at a live event held at The Phoenician, one of Scottsdale's most luxurious resorts. The collection of top-tier properties featured three homes local to Scottsdale and Paradise Valley, one of which was owned by former Magellan Fund Manager Peter Lynch and another by MLB legend Randy Johnson. Most notably, the auction of Villa Paradiso — formerly Arizona's most expensive listing — when closed will set the record for the highest sale price ever in Paradise Valley. Previously listed as the most expensive home in Arizona for $35 million, Villa Paradiso achieved the highest sale price in Paradise Valley in the past decade. The estate also sold as the highest residential sale in Arizona in the last year, marketed in cooperation with Sandra Wilken of Sandra Wilken Properties. The 30,858-square-foot estate — designed by renowned architect and planner Vernon D. Swaback, an apprentice of Frank Lloyd Wright — offers expansive views of the exclusive Paradise Valley and boasts numerous amenities including custom-built spaces to house art and automobile collections. "I am very pleased with the Concierge Auctions team's work," said seller Sussman. "Their efforts did a great job fleshing out not only national prospects, but also those in the local market. In the end, the team was able to achieve a great result in a difficult market, and the home sold for the highest price ever in Paradise Valley." Previously listed for $9.5 million, the sale of former Magellan Fund Manager Peter Lynch's Scottsdale estate marked the highest sale price in the exclusive 180-home community of Estancia since 2014. The multi-structure, Southwestern oasis sold in cooperation with Julie Rohr of Walt Danley Realty. Designed by Jeff Biever Architecture and Mariette Gomez Design Group, the compound offers a traditional adobe exterior with contemporary interiors featuring a light-filled, open floor plan with multiple floor-to-ceiling fireplaces, soaring ceilings, skylights and walls of windows. Previously listed for $14.5 million, MLB legend Randy Johnson's Paradise Valley compound sold in cooperation with Jonathan Friedland of The Joffe Group, Launch Real Estate LLC. 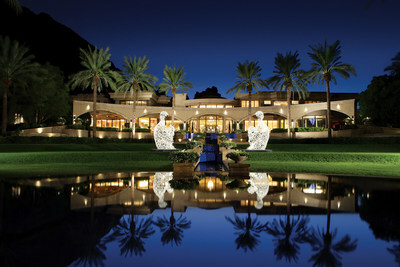 Situated at the base of Mummy Mountain, the 25,416-square-foot Mediterranean estate features a dramatic two-story entry foyer; seven en-suite bedrooms; 12 bathrooms; a separate master wing with access to a trellised rose garden; a gourmet chef's kitchen with large island and peninsula bar seating for eight; a cinephile's dream home theater with tiered seating; a music lover's entertainment wing with a dedicated recording studio, live performance stage, and collector's music instrument showroom; a separate billiards room and wet bar; a poker room; two executive offices/studies; a three-story elevator; and a climate-controlled wine cellar. Other properties sold during the sale include three tropical homes in The Bahamas and Costa Rica, and an estate in Fairfield, Connecticut. The final sale price of each property in the January Sale will remain confidential until at least 30 days after the transaction closings. As part of Concierge Auctions' Key for Key® giving program in partnership with Giveback Homes, each property sold will result in a new home built for a family in need. Concierge Auctions is the largest luxury real estate marketplace in the world, powered by state-of-the-art technology. Since its inception in 2008, the firm has generated billions of dollars in sales, broken world records for the highest priced homes ever achieved at auction, and is active in 40 U.S. states/territories and 27 countries. Concierge curates the most prestigious properties globally, matches them with qualified buyers, and facilitates transparent, market-driven transactions in an expedited timeframe. The firm owns arguably the most comprehensive and intelligent database of high-net-worth real estate buyers and sellers in the world. As a five-time honoree to the annual Inc. Magazine list of America's fastest-growing companies, it now joins the Inc5000 Hall of Fame; was named No. 38 on the 2018 Entrepreneur 360™ List recognizing 360 small businesses every year that are mastering the art of and science of growing a business in the areas of impact, innovation, growth, leadership, and business valuation; and has contributed more than 200 homes to-date as part of its Key for Key® giving program in partnership with Giveback Homes, which guarantees that for every property the company sells, a new home will be built for a family in need. For more information visit conciergeauctions.com.